RingCentral is the industry leader for powerful Internet fax service, helping tens of thousands of customers worldwide improve and manage their daily fax communications. Purpose-built for small business, RingCentral Fax comes complete with advanced email fax capabilities, delivering the professionalism and functionality today’s business requires. From toll free and local numbers to advanced fax software, RingCentral fax service gives you everything you'd expect from a modern, business-ready fax solution, with the flexibility needed to easily send and receive faxes, regardless of location. Every small business needs fax capabilities for contracts and other important business documents. And with the right service—like RingCentral Fax—there’s simply no need to own or maintain a fax machine anymore. This means no more waiting for transmissions to get through or dealing with busy phone lines. Say goodbye to paper jams. By faxing online, you get fax-to-email capabilities, which means your faxes are converted straight to email for easy anytime, anywhere retrieval. 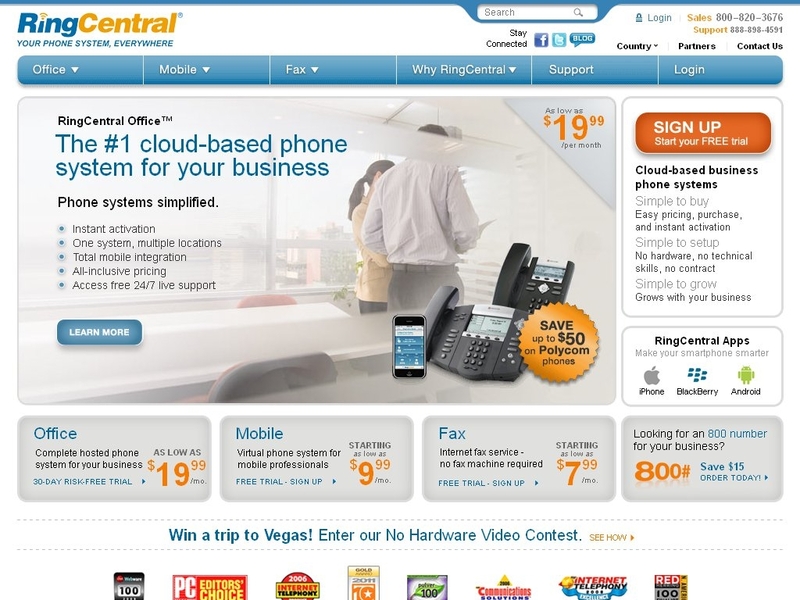 Go ahead and start faxing online with RingCentral. A time and money saving service, online fax enables faxes to be sent and received from Microsoft Office®, email, even your cell phone. Free fax software gives your business a professional look by allowing you to electronically sign and edit faxes and design custom cover sheets. You can send faxes quickly from any Microsoft Windows® application, block junk faxes and attach documents. A true money- and time-saving advantage for any business, online fax the RingCentral way will help take your business communications to the next level. If you use or have used RingCentral Fax in the past, please share this page using the buttons above and be sure to leave a rating and review of the service so other people can make an informed buying choice based on your experiences! It's free and you are not required to register! If you have experience with RingCentral Fax, we kindly ask that you please share your thoughts with others on this website by submitting an honest, detailed review. Your feedback will help prospective clients decide which service provider to choose and is incredibly valuable to the community itself as well as RingCentral Fax's representatives that read this website. Please do not use this form for support inquiries. Be aware that these reviews may also be syndicated and displayed on RingCentral Fax's website, and as such a strict review policy is in effect. All reviews are moderated prior to being published, and reviews that do not contain concise, detailed comments or do not support their associated ratings will not be published. We urge you to be as detailed as possible when leaving feedback, as RingCentral Fax may also use this information as feedback for their business and are themselves encouraged to reply to reviews posted to their listings. Amazing service! Our office has been on their system for over 6 months now and we amazed at all the features they provide. I am a Canadian customer. Bought ringcentral fax service and it seems they have an issue with sending faxes to Canadian toll free numbers (due to the fact that most of these companies only accept calls within Canada). I have called them and they can't give me an ETA to when the problem will be resolved. Do not use this service in Canada. Probably great in the States. If you live in Canada and deal with big companies that have 1-800 numbers, this service is not for you. Since many companies that have 1-800 numbers in Canada only allow calls from inside Canada to reduce fees, when you try to fax them documents it says "no answer" due to the fact that the numbers are still hosted on American servers. Until Ringcentral fixes this, not a good idea. Had the same problem with Vocalocity's phone pbx service. Tried to sign up for the internet fax 30 day free trial. It was impossible to do online. When I called (there was a horrible phone connection with an echo which apparently is the quality of their phone lines) she told me that the initial sign up could not be done online (so why offer it?). After repeating all the information they needed, she informed me there was a 7 day free trial. When I told her I was not interested in dealing with a company that uses false advertising, she quickly said they would give me a 30 day trial... Needless to say I refused. Used the service for over a year and have no real complaints. I'm old and can use it! RingCentral is simply the best and most economical business service we use. The phone company wanted five times as much for an 800 number and the cable company wasn't much better! I can check my faxes any time in my email box, then forward the emailed faxes to whomever. No hard copies! Very economical, efficient and GREEN. I have never had anyone complain about not being able send me a fax, which used to happen all the time before with my landline... I'm a getting into the senior years and not too technologically savvy, but was able to navigate their online interface easily. Twice I called their support lines and had to hold for a little while, but I guess that's normal these days, but once I got through support was helpful. Would definitely recommend this service! I was skeptical at using the service initially but decided to do the 30 day trial first. It was such a great tool for my business to have that I decided to signup with them. I love the service and have had a great experience with them. Highly recommended to any small business out there that use fax on a daily basis and would like to trim their fax cost!